What Is The 5th (Fifth) Commandment In The Bible? What is the Fifth Commandment in the Bible? Is it still relevant today? What would you feel like if you had ten cannons pointed directly at you? Intimidating, isn’t it, but that’s just how the Prince of Preachers, Charles Spurgeon described the Ten Commandments. That makes sense because they get our attention and they can also hurt us (or kill us) for breaking them. If we break them, they will surely break us. It’s like trying to break a cast iron anvil with a stick. The first four Commandments are directly related to our relationship with God and the last four in how we deal with our fellow man and woman. These timeless laws of God are just as relevant as the day in which they were written. There should never be a time when it’s okay to steal and certainly murder. These laws of God show us a lot about God and how He is high and lifted up above His creation but at the same time, He has not left us on our own. God promises to bless those who obey His commandments but what we find is that keeping His commandments brings us blessings as a result. The consequences of obedience are always better than disobedience. 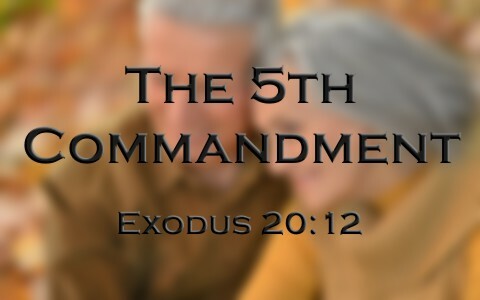 I find it interesting that God gave as the first commandment in our human dealings with one another and of first importance in these last four horizontal commandments was “Honor your father and your mother, that your days may be long in the land that the Lord your God is giving you” (Ex 20:12). Why wouldn’t God put “You shall not murder” as the Fifth Commandment instead of the Sixth (Ex 20:13)? Think of it this way; when children are taught from an early age to obey God, and that includes honoring their parents, then there should be fewer murders and fewer thefts, adulteries, and stealing. When a child doesn’t honor their parents, then they lose the promise that “your days may be long in the land” and their days may turn out to be few. This may explain why God places such a high value on honoring parents and this commandment is directed toward children and how they should treat their parents. Of course, this is for adults too because they also have parents. It never says we must honor them only until adulthood. How can someone honor a parent that has abused them sexually, physically, or emotionally (mentally)? It’s not easy. When one man I know still couldn’t forgive his parents after many years, I told him that he was withholding from his parents what God had freely given him. His parent’s debt was enormously considerably less than that which God has forgiven us. It is by far of an infinitely higher degree. I suggested that he write a letter and pour out his heart about all this pain and then put it in a shoebox and bury it. Have the funeral. God loved us so much that He willingly sent His Son Jesus to die for us while we were still His enemies (Rom 5:10). How many of us would die for our enemies, like terrorist or murderers? If Jesus died for wicked, ungodly, sinners who were natural enemies of His (Rom 5:6-10), why can’t we honor our parents as commanded to do so? I have never met a perfect parent. Only God the Father is the Perfect Parent. No human alive could ever be that. Give them a break. They did the best they probably knew how. Possibly their own childhood was full of even worse things than you or I have experience. In our church’s nursing home ministry, we meet some of the loneliest people on the planet. In some cases, these (mostly) widows painfully tell me that their own children won’t come to visit them…even those who live in town. One church deacon’s mother told me that her daughter never came to visit her on Mother’s Day, even though she only lived five blocks away! How tragic. To me, that is breaking the Sixth Commandment. We can also dishonor our parents by the way we talk to others about them or in the way that we talk to them. How often I’ve heard a professing Christian say that they can’t forgive their parents…even though they’re in their grave! You can honor your parents long after their gone but you can also dishonor them after they’re gone and I believe it is sinful to speak about the dead, particularly parents. And there is no time limit or restriction about honoring our parents. This law never expires. I urge you to honor your parents, alive or not, and not because they deserve it but because God commands it. He too disciplines us as we need it and so our parents, certainly not perfect, and as the author of Hebrews writes, “what son is there whom his father does not discipline? If you are left without discipline, in which all have participated, then you are illegitimate children and not sons” (Heb 12:8). Most of us “have had earthly fathers who disciplined us and we respected them. Shall we not much more be subject to the Father of spirits and live” (Heb 12:9) and “as it seemed best to them, but he disciplines us for our good, that we may share his holiness” (Heb 12:10). Honor your mother and father and their mother and father (grandparents) but this command certainly extends to foster parents or relatives who children are living with or have lived with in the past. That is very pleasing in the sight of God.